All of Chris Hart's how-to-draw titles are best-sellers. And the best-sellers among all of his best-sellers are the ones about animals. 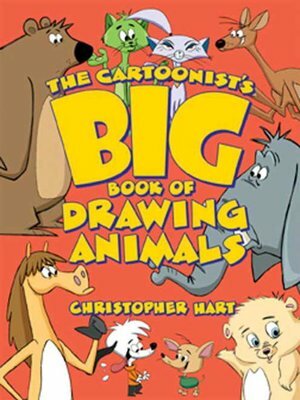 How to Draw Cartoon Animals, just one example, appears regularly on the BookScan Top 50 Art Books list, with more than 190,000 copies sold. Now The Cartoonist's Big Book of Drawing Animals is ready to roar onto the market! All the most popular animals are here, including dogs, cats, horses, penguins, lions, tigers, bears, and elephants, as well as the favorite sidekick animals—pigs, kangaroos, giraffes, turtles. Simple step-by-step drawings show how to capture every cartoon emotion, from cutesy-sweet to begging to scheming, and how to create every box-office type, from baby animals to villain animals to clueless animals and much more. Faces, bodies, paws, feet, wings, tails—every part of dozens of animals is explained in this bumper book by the world's leading author of instructional art books. It's a mega-menagerie for cartoonists!